This is one of two stories I did for The Reader’s (www.thereader.com) February 2017 cover package whose headlines read “Resettlement in America Takes a Village” and” Immigration: Refugees Reunite and Resettle; Fighting for Dreamers.” The story shared in this post is about refugees and asylees and their journey to new lives. Those tired, poor, huddled masses yearning to breathe free in America include refugees and asylees fleeing war and persecution. Displaced persons also include victims of international trafficking. Regardless of what’s uprooted them, these souls without countries come from homelands too risky or unstable to remain in or return to. Most newcomers escaping duress lean on enclaves of fellow countrymen who preceded them here to show them the ropes. “In Nebraska, 95 percent of our families coming here are reuniting with friends and family already here,” said Lutheran Family Services (LFS) program development officer Lacey Studnicka. “It’s really those ethnic communities that show the new arrivals the most support and you see that historically in our country. It’s the ethnic community that does the heavy lifting in welcoming them and getting them going. That just happens organically. Those looking to resettle don’t care if its crass calculus, noble ideals, human compassion or luck of the draw that gets them out as long as they touch freedom again or perhaps for the first time. Subsisting in camps or war zones awaiting release means base survival marked by uncertainty. Resettlement is bittersweet. It means leaving everything you know for a fresh start in a safe new place. Relocation and assimilation bring stressors but mainly brings opportunities. LFS, the state’s largest resettlement agency, offers access to medical, behavioral health and legal services, ESL classes, career and life skills mentoring and employment searches. “We have an 85 percent success rate placing refugees into jobs within the first 60 to 90 days they’re in the U.S.,” Studnicka said. Most caseworkers are former refugees. The U. S. is a major safe harbor, though ever tighter screening means individual cases can take years to clear. Nebraska’s done its part receiving and resettling folks, especially since the 1970s. “We have seen our numbers double over the last five years,” said Studnicka, who estimates 25,000-plus refugees reside in the metro. No one knows if President Trump will follow through on vowed policies to close America’s southern borders and restrict Muslim arrivals. Middle East crises have propelled a migration flood in Europe. Refugee numbers worldwide are at levels not seen since World War II. An estimated 14 million await return or resettlement. Only a fraction will be permanently resettled due to capacity, security or political considerations. America annually receives 75,000 to 100,000 refugees. Each year the President in consultation with Congress decides how many and from what countries of origin will be accepted. Who Nebraska takes depends on what groups the state’s best resourced to accommodate in terms of available language-cultural-technical support. After past waves of Vietnamese, Russian Jews, Bosnians, Croatians, Afghans, Sudanese, Somalis, Iraqsi, Burundi, Rwandans, Butanese and Karen. The newest groups include Congolese. Despite objections by Gov. Peter Ricketts Syrians are being resettled, too. LFS officials say they receive little opposition to its refugee work and are unaware of any hate crimes directed at refugees in the area. Still, she conceded, “It’s hard. There are language and transportation barriers.” Most newcomers find their education and professional training doesn’t meet certifications here and that forces them to fill the same unskilled jobs as many immigrants – meatpacking, hospitality, transportation. Former Somali refugee Dekow Sagar said, “I do remember thinking if I had the means to go back to the refugee camp I would.” But his persistence paid off and he’s now program director at the International Center of the Heartland, an LFS operation that extends services as needed to refugee clients beyond the initial federally funded 90 days. Sagar was 8 when he and his family left the carnage of the Somali war for a camp in Kenya. They expected to be there a short while but remained years. He grew to adulthood there and after assisting Doctors Without Borders and the United Nations, he came to the U.S. in 2007. He lived and worked in Des Moines, Iowa before taking a job with the Sate of Nebraska and then joining LFS. Abdullah Alalo was a married, 26-year-old medical school graduate when the terror threat in Syria forced him to seek asylum. He came to the U.S, in 2013 and after living in Los Angeles and Phoenix, he moved to Omaha, where he works as a machine operator. He and his wife, who joined him in the States a year after his arrival, just bought their first home and are expecting their first child. After despairing he couldn’t follow his intended career field here, he’s found contentment. Khalid Khan worked as a U.S. military interpreter for 10-plus years in his native Afghanistan until it got too hot to stay. He and fellow interpreters were made hard targets by the Taliban. He came here as a Special Immigrant Visa holder under the Afghan Allies Protection Act. He works in IT and drives for Uber. 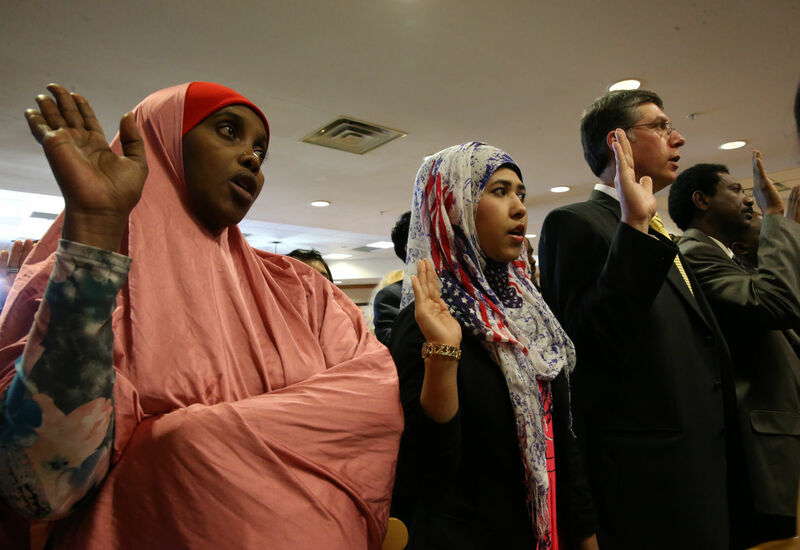 Once, Khan said, a local passenger questioned his fealty as a Muslim to America. He replied he helped defeat a common enemy to persevere America’s freedom, faced death threats, suffered a stoke and PTSD and left his life to move here. “He thanked me for my service to America,” Khan said. He, his wife and their children spent months in hiding before coming to the U.S. in 2014. Studnicka said as the public learns the sacrifices newcomers make and hardships they face, more assistance flows. LFS partners with Christian, Jewish and Muslim faith communities and local businesses, from corporations to small companies, to outfit the residences of new arrivals, welcome them at the airport, do grocery shopping, teach English, make home visits, mentor, et cetera. Staff are often asked to present on resettlement. Some refugees tell their stories before these audiences. Where there may be service gaps, refugees fill them. Studnicka said. “People struggle when they don’t have enough resources around them. The more resources, the more success they have,” adding that resources are no problem here. How much help a family needs, varies. Omaha has some fairly well-established refugee communities. “The Sudanese have been here a (relatively) long time and they have quite a robust community,” she said. “The Karen from Burma are just exceptionally organized and cohesive. They’re building a multi-million dollar church and community center. We have about 5,000 refugees from Burma that live in Omaha and over 400 families have purchased homes — a lot within the first two years they lived here. They’re working at meatpacking plants, their kids are going to college with full ride scholarships because they’re such excellent students. Whatever the group, Studnicka said gratitude and generosity abound. For Studnicka, it’s a no-brainer that an immigrant nation like America should welcome newcomers who bring good spirits, high aspirations, strong work ethic and rich culture. Those who’d block certain groups, she said, have unfounded fears, inflamed by rhetoric. She invites the public to be neighbors, not strangers. Two events this summer offer meet and greet opportunities: The June 30 World Refugee Day festival at Joslyn Art Museum and the August 4 New American Arts Festival in Benson. EDITOR’S NOTE: The new administration is issuing its first immigration orders as we go to press. Local groups, especially the ones mentioned in this story, are organizing now to respond to changes that threaten decades of proven, peaceful resettlement processes, with little to no promise of improving safety, while feeding into and supporting extremist narratives and recruitment. Stay tuned to follow-up coverage online at TheReader.com. 2018 UPDATE: Since writing this story about Akoy Agau, the most heavily recruited Nebraska prep baskeball player in years, his collegiate hoops journey has gotten complicated. He started at Lousiville, then transferred to Georgetown, then detoured to SMU and now he’s back at Lousiville. A book about the places that basketball has taken him comes out the end of this year by Omaha native and Central High grad Steve Marantz, who authored a previous book, “The Rhythm Boys of Omaha Central,” that dealt with basketball and social upheaval. UPDATE: I have no idea if Akoy Agau is even considering Nebraska or Creighton or UNO, but any local hoops fan has to hope that one of the three in-state Division I programs manages to land him. If you saw Agau lead Omaha Central High to the Class A state title against Omaha South the other night then you saw what a difference maker he can be. If you didn’t see him, then all you need to know is that he had 16 points, 13 rebounds and 14 blocks. That’s right, 14. It’s not the first time he’s put up numbers like these in the state tournament and with his senior year to go and Central returning far more than just him it’s a sure thing, barring injury, that he will dominate the tournament again next year. The University of Nebraska needs him the most. The program is mired in medicority and it needs a boost to go along with whoever the new head coach is going to be because it’s going to be players not coaches who turn things around and Agau is the type of player you can build a program around, especially if you surround him with eight or nine other legit prospects. Creighton is of course a rock solid program by comparison but a mid-major like CU is always in a precarious position and it needs him to infuse local talent into a program whose best players come from Iowa and everywhere else but Nebraska. When Antoine Young departs after this season there will not be a single scholarship player from the state left in the program. The fact that Agau is an Omaha Public Schools student and a rare quality big man would help solidify the program over the next five-six years. UNO is the least likely to get him but imagine what Agau’s presence could do in raising the profile of this fledgling D-I program. He could help turn it from a pretender to a contender in a very short time. Chances are, Agau will not stay home but instead take his considerable upside somewhere else. I hope I’m wrong. Most of my writing these days covers the arts-culture-creative scene but I still jones to do a sports story every now and then, and here’s a new one for The Reader that I am fond of. It profiles Akoy Agau, a 17-year-old junior at Omaha Central High School, where he is both a top student and a major college basketball recruit whose team is heavily favored to win its third consecutive Class A (largest class in Nebraska) state title. Agau is not only very tall at 6’9 he is highly skilled and athletic, which makes him the rare quality big man in these parts. His story takes on another dimension when you add to it the fact that he and his family are Sudanese refugees who were displaced by war in their homeland and he was only introduced to basketball after he came to the States, where he’s adapted remarkably well and progressed his game at an exceedingly fast pace. He has another year of high school ball ahead of him, and then it will be off to play collegiately somewhere. Whether or not he becomes an impact player at that next level is beside the point given how much he’sovercome and how far he’s traveled. In this sparsely populated state where basketball’s never fully taken root, the annual hoops crop is slim pickings, especially when it comes to big men. Only rarely does a promising post player emerge on the high school scene here and it’s even rarer for one to do much at the next level. All of which explains some of the intrigue attending Omaha Central junior Akoy Agau, the intimidating 6’9, 230-pound inside presence for the two-time defending state champion and season-long No. 1 ranked Eagles. Only recently turned 17, he’s still growing physically and adding to an already formidable skill-set. A scary proposition for opponents. An enticing prospect for the many colleges recruiting him. With five championships in the last six years, Central’s a dynasty program. Success only begets more, as the metro’s best talent now flocks to the old downtown school on the hill. Despite producing many all-state players, Central hasn’t had a really good big man since star-crossed Dwaine Dillard in the late 1960s. Until Agau. He’s not only tall, he possesses a huge wing-span, can jump and run the floor better than most kids half his size and shows uncanny timing and instincts for blocking shots. Though he must work on his post moves, ball-handling and jumper, he displays a soft touch around the rim, in the lane and outside. Adding to interest in him is how this South Sudan native, who never heard of basketball in Africa, came to be in Omaha at all, much less play at a high level. He lived with his refugee family in Khartoum, Sudan and in Cairo, Egypt for the first six years of his life owing to civil war and famine in his homeland. His Christian Dinka family came to the United States. through a church-based NGO, settling outside Baltimore, Maryland in 2002. All his mother, Agaw Makeir, knew about the U.S. was that it was far off. Fears about not knowing English or American ways were eased by assurances that just as missionaries helped them in Africa other good samaritans would help them here. After a year in Maryland the family moved to Omaha, where refugee relatives preceded them. Omaha is where Agau was introduced to basketball. Central coach Eric Behrens first laid eyes on him when the then-14-year old was shooting hoops one summer day at the outdoor court adjoining the Mason Apartments that the Agaus and other Sudanese families resided in. The youth’s size naturally peeked the coach’s curiosity. Behrens got to know him at Norris Middle School, where Agau attended and where Central often practices. As the Norris basketball team would wind up workouts Behrens and Co would arrive. The two formed a bond. Yet Behrens was surprised when Akoy elected to go to Central because most Sudanese student-athletes were opting for Bryan. Agau’s made most of his considerable progress since 7th grade, when he first got serious about playing. He’s excelled with Team Nebraska select clubs, balling all over the city, often with older players. The last few summers he’s gone to elite AAU camps and tourneys around the nation to hone his game and raise his stock. Upon meeting him the first thing that impresses you beyond his size is his composure and confidence. Struggling to survive and assimilate gave him life experiences rare for an American teen. 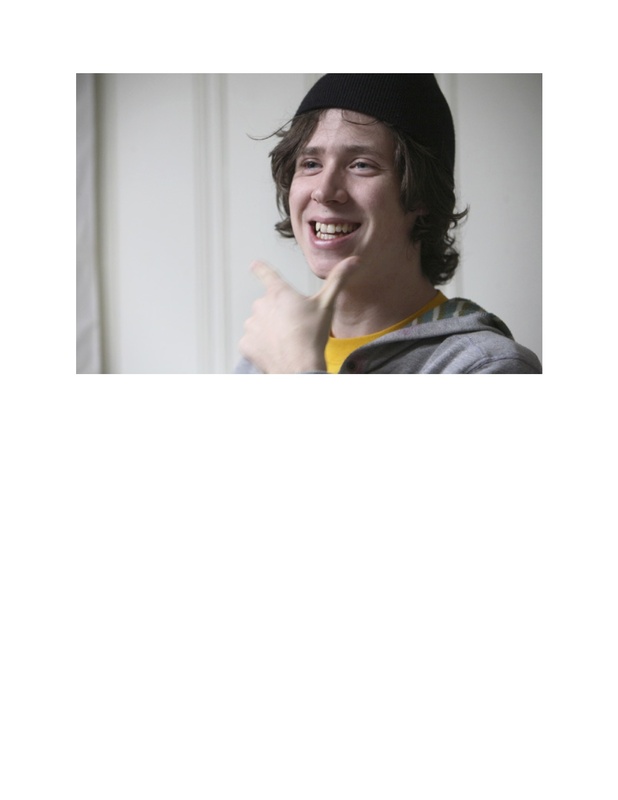 “It was a wild journey,” he says of the his family’s crucible. He’s sure the journey wizened and toughened him. The war in Sudan did more than disrupt life, it claimed the lives of several loved ones. Akoy’s father Madut Agau lost his first wife. Akoy’s mother lost her father and five siblings. The family fled attacking government forces and warring factions. Once, Makeir fled with 3-year-old Akoy on her back an infant in her arms. Months on foot exposed them to danger and death by starvation, disease, wild animals, violence. Years of subsistence living in tent city refugee camps short on food and water gave way to starting over in America, where the family scraped for every dime and depended on the kindness of strangers until Akoy’s father found steady work at the IBP meatpacking plant in Denison, Iowa. The elder Agau stays there during the week, coming home weekends to be with his wife and children. Having made it out the other side alive, Akoy exhibits a poise beyond his years. As a tall African refugee with a talent for the game, he’s the center of attention wherever he goes but he seems comfortable in his own skin. “Very mature, very much so,” says his coach, Eric Behrens. “All those things that make you stand out, you can handle it in one of two ways – either you embrace it and you go the extroverted route or you kind of shy away from it and squeak into the corner. It’s hard to be in the middle when you’re a guy that gets a lot of attention like that. He’s definitely embraced it and fits in really well. And he can play a little, too. Observers rate Agau as the state’s best Division I college basketball prospect, period, since Erick Strickland and Andre Woolridge in the early 1990s. Strickland and Woolridge were small guys though. The few big men from Nebraska who’ve attracted power conference suitors and made an impact in big-time college hoops include Rich King, Dave Hoppen and Chuck Jura. Ranked a 4-star, top 100-150 recruit, Agau’s projected as a legit major or mid-major contributor in college at the power forward spot. The fact he’s come so far in such a short time bodes well for his future hoops. He was barely 15 when he started for Central as a freshman. He was a factor right away but still largely a role player. His profile dramatically rose in the 2010 state finals when he erupted for a monster game versus Norfolk, recording 18 points, 15 rebounds and 9 blocks. His near triple double helped lock up the title and served notice Central would be all but unbeatable with him around. He didn’t look it, but that big stage freaked him out. “Well, first of all, that was probably the most nerve wracking game ever. When we were in the locker room Coach Behrens was like, ‘There’s a packed house and probably most of them are for Norfolk.’ I went out ready to warm up, looked up and saw so many people, and I turned around and ran right back to the locker room. I was so nervous, it was the scariest thing. But then once the game started everything was just normal. I basically just played and didn’t think about it. A year later at state he and his team once again found themselves matched up with Norfolk, only in the semifinals, and this time he got his triple double with a 11-10-10 line. He went on to lead Central to the championship against Bryan. With Agau and 6’6 Tre’Shawn Thurman choking the paint, contesting any shot launched near the basket, and smaller teammates pressing, Central held foes to a stingy 34 percent field goal mark. In the regular season the Eagles had 153 blocks to their opponents’ 22. They forced 470 turnovers, committing only 309. At 27-0 entering the 2012 state tournament, Central is the overwhelming favorite to repeat as Class A champs this weekend at the Devaney Center in Lincoln. The Eagles dominated the regular season, winning by an average score of 71 to 45, and its most dominating player by far is Agau. He normally puts up modest stats, averaging about 12 points, 6 rebounds and 2.5 blocks per game. But as anyone who’s ever seen him play will tell you, it’s the intangibles that make him a difference-maker on a remarkably well-balanced squad that pressures foes with quickness, height, leaping ability, a deep bench and effective passing. They get lots of steals that lead to fastbreak layups and dunks. The way Central shares the ball explains why no one averages more than 12 points a game. Any one of seven guys can go off any given night. Agau could easily double his point total if Central force fed him the ball. He’s cool the way it is. Behrens appreciates his big man not being a prima donna. “He’s a great teammate. For as much attention and for as many Division I scholarship offers as he has he’s very unselfish. He’s really just focused on winning – whatever that takes, and that’s a really nice thing for us coaches and for his teammates to have, and it’s kind of rare. On a team without a star, Agau is its MVP. When he fouled out of the regular season finale versus Bellevue East the Chieftans made a run. He sat out the district opener recovering from minor knee surgery and in his absence lowly Northwest played Central even until the Eagles pulled away at the end, among the few times anyone’s hung withthem that long. The lead is usually double digits at the half and the game long decided before the final quarter. If Agau leads Central as expected to the Class A title, he will be three-fourths of the way toward a goal he set as a 13-year-old. Local fans would love to see him end up a Husker, Bluejay or Maverick, but his offers extend far beyond Nebraska. He’s not hinting which way he’s leaning, though his mother makes no bones about preferring him to stay close to home. Her fondest wish for the family’s move to America was for Akoy, her eldest, “to try and help himself for his future” and for all her kids to take advantage of opportunities unavailable in Sudan. She’s thankful her kids can “focus on school and education.” She’s thankful, too, that Akoy is thriving and setting a good example for his brothers and sisters. “He’s a good big brother. 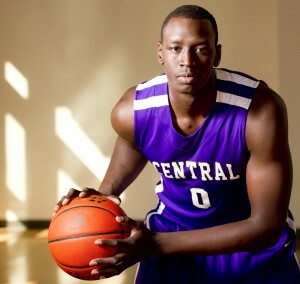 We hope his brother Magay will follow him.” Magay is a very tall and talented freshman at Central. The fact that Akoy still retains the Dinka language and some Arabic also pleases his mother, who keeps Sudanese cultural traditions alive at home. Still, he’s keenly aware basketball is his ticket to larger opportunities. He’s also aware of the attendant expectations and hype that come with success. That same low-key, taking-care-of-business attitude permeates the Central program. It helps explain why the Eagles have played consistently well, avoiding the lulls that happen when teams take opponents for granted or get too far ahead of themselves or get too full of themselves. It’s why the pressure to live up to being the Nebraska prep version of the high-flying Phi Slamma Jamma hasn’t derailed them. Typically, Akoy takes it all in stride. He has another year of high school ball ahead of him, and then it will be off to play collegiately somewhere. Whether or not he becomes an impact player at that next level is beside the point given how much he’s overcome and how far he’s traveled. 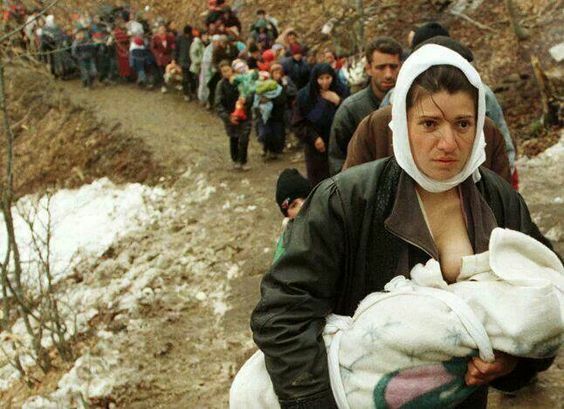 Here is a story I did in 1996 in the flood of refugees coming to America from war-ravaged Bosnia and Serbia. I tell the story of two families from Saravejo whose lives were turned upside down when the city fell under siege. Rusmir and Hari stayed behind to fight, as their wives and children narrowly escaped, eventually to the West. The men were eventually reunited with their families and ended up starting new lives in America. In my hometown of Omaha no less. I came across this story when I learned about a music and dance performance that a local choreographer organized as a way of commemorating the experience of these Bosnian refugees. The cathartic performance served as a bridge between the war that changed everything and the peace they had to flee their homeland to find. 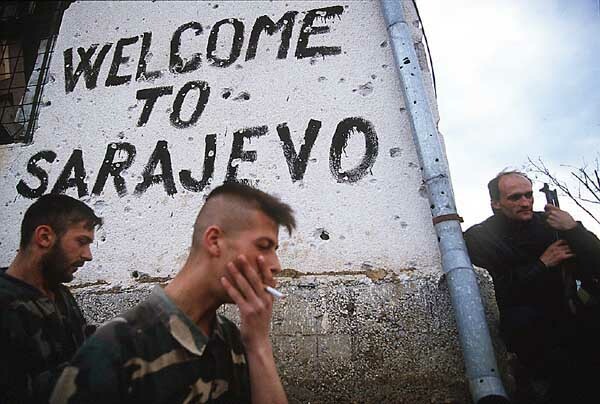 Even with United States peacekeeping troops stationed in Bosnia-Hercegovina, the war-ravaged nation and troubled Balkan region remain a shrouded mystery to many Americans. But on two successive nights in October, audiences packing a Creighton University theater came face-to-face with the tragic, ultimately triumphant odyssey of Omaha’s Bosnian war refugees. The work incorporated vigorous Bosnian folk dances and songs symbolizing the relative harmony in Bosnia before the war and the healing so sorely needed there now. Ironically, a dance whose context was an ethnic war, joined Croats, Muslims and Serbs in a unifying celebration. The refugees are among a growing, diverse Bosnian colony that has sprung up in Omaha since 1993. They say the Bosnia they knew was free of ethnic and religious strife until Serb nationalism began rearing its ugly head. Many are natives of Sarajevo, where they enjoyed an upscale, Western European lifestyle. Since escaping the carnage to start over in America, they’ve forged a tranquil Little Sarajevo in Omaha. Both men are Muslim. Rusmir’s wife is Serb; Hari’s, Croation-Catholic. They say mixed marriages such as theirs were typical. The two men fought side-by-side defending their beloved Sarajevo, the besieged Bosnian capital devastated by Serb aggressors. Talking with Rusmir and Hari today, surrounded by loved ones in their safe, comfortable southwest Omaha apartments, it’s hard to imagine them as fierce soldiers engaged in a life and death struggle with forces who outnumbered and outgunned them. But then Rusmir passes around snapshots of he and Hari in camouflage fatigues, armed to the teeth, outside the burned-out shell of a train station. A later photo shows Rusmir, usually a burly 240 pounds, looking pale, drawn and shrunken from the near-starvation war diet. 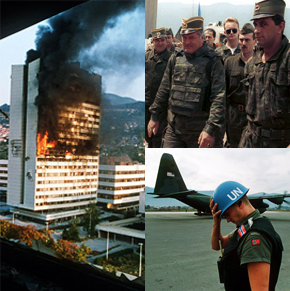 Although Serbia invaded Croatia by late 1990, beginning the pattern of pogroms and atrocities it repeated elsewhere in the former Yugoslav Republic, most Bosnians never suspected the conflict would affect them. 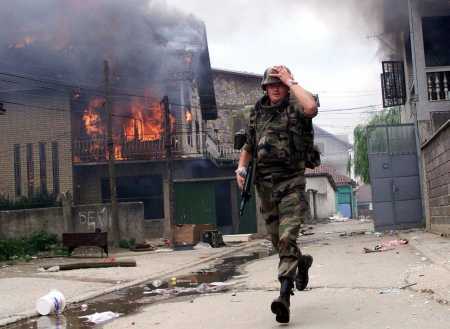 But it did, beginning, shockingly and viciously at noon, April 4, 1992, when Serb artillery units dug in atop the hills overlooking Saravejo launched an unprovoked, indiscriminate attack on the city’s homes, streets and businesses. Rusmir was eating lunch in a cafeteria when the first explosions rocked the city. He was trapped there until morning. 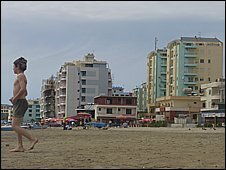 “I saw many, many damaged houses and cars and dead people in the streets. It was the first time in my life I saw something like that,” he recalls. It was the start of a three-year siege that killed thousands of civilians and soldiers. At the family’s apartment he found his wife Zorana, 39, and their children Ida and Igor, then ages 8 and 2, respectively, unharmed, but “very scared.” He immediately set about finding a safe way out for them. Escape was essential, since Ida suffers from a serious kidney disease requiring frequent medical treatment, and his family’s Muslim surname made them targets for invading Serbs. As for himself, he had no choice but to stay – and fight. The roads and fields leading out of town were killing zones, manned by roaming Serb militia. Air service was disrupted. With the help of Jewish friends he finally got his family approved for a flight to Belgrade, Serbia several days later. On the day of departure Zorana and the kids boarded a bus for the tense ride to the Serbian-held airport. As it was too dangerous to be seen together, Rusmir followed behind in a car. The scene at the airport was chaotic. Hundreds of people milled about the tarmac, frantic not to be left behind. When a mad dash for the plane began, Zorana, carrying Igor in one arm, felt Ida being pulled away by the surging crowd. She grabbed hold of her daughter and hung on until they were aboard. From a distance Rusmir watched the plane lift off safely, carrying his family to an uncertain fate. It was the last flight out for many months. Three-and-a-half years passed before he saw his family again. “You had to say some Serb name to save your life,” notes Hari, whose family took similar precautions. Like Rusmir and Zorana, Hari and his wife Marina were desperate to get their daughter Lana out, as she has a kidney condition similar to Ida’s. Marina and Sakic’s kids eventually fled to Croatia. In Belgrade Zorana often confronted Serb enmity, such as when a hospital denied Ida treatment fate learning her real name. From Belgrade, they fled to norther Croatia, staying with relatives and friends. Life in Croatia had a semblance of normality until Croat-Muslim hostilities erupted. Then Zorana was denied work and Ida expelled from school and refused care. A human rights organization did fly Zorana and the kids to London, where her brother lived, but they were denied residency and returned to Croatia. Growing more desperate, she pleaded her family’s case at every embassy, to no avail. With few resources and options left she heard about the International Organization for Migration (IOM), a humanitarian agency offering visas based on medical need. After her first entreaties were rejected she went to IOM’s offices “every morning for three months,” before finally getting the visa that eventually brought them to Omaha in October, 1993. Zorana was among the first group of Bosnian and Croatian refugees to arrive here. Ford arranged for the family to live at the home of Dr. Dan Halm and at her urging Zorana, an attorney in Saravejo, earned a para-legal degree at UNO while working part-time jobs. Zorana now works full-time at Mutual of Omaha. Ford says the contacts Zorana made here as a result of her own refugee experience have aided other Bosnians in settling here, including Rusmir’s sister and brother-in-law. Since moving her family to the Woodcreek Apartments, Zorana has guided 12 other refugee families there. 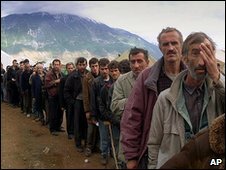 Meanwhile, Rusmir, who as a young man served in the Yugoslav equivalent of the CIA, had joined Hari and others in mobilizing the local Bosnian Army, It was a civilian army comprised of Muslims, Croats and Serbs, They lacked even the most basic supplies. Uniforms were improvised from sleeping bags. Many soldiers fought in athletic shoes. Shelling and sniper fire continued day and night. The streets and outlying areas were a grim no-man’s land. The only respite was an occasional cease-fire or relief convoy. As the siege progressed conditions worsened. Rusmir’s and Hari’s homes were destroyed. But life went on. “In war it’s not possible to keep a normal life, but we tried,” says Rusmir. For example, school-age kids who remained behind still attended classes, and Hari’s wife Marina gave birth to their son, Adi, on May 22, 1992. “At that time the situation was terrible, especially for babies. No food, no water, no electricity , no nothing,” Hari recalls. Somehow, they hung on. Marina and their two children got out as part of a Red Cross convoy that fall. Hari and Rusmir fought in a special unit that took them behind enemy lines to wreak havoc, do reconnaissance, collect intelligence and capture prisoners. Miraculously, neither was wounded. Two of his best friends did not – Dragan Postic and Zelicko Filipovic. Rusmir witnessed acts of barbarism, heroism and sacrifice, An artillery shell landed amidst a group of school kids during recess, killing and maiming dozens. “That was very awful.” In the heat of battle, a comrade jumped on an enemy tank and dropped hand grenades inside the open turret, killing himself and the tank’s crew. Despite overwhelming odds and losses the city held. “We stopped them…we survived,” Rusmir says. By the time a United States-brokered and NATO-enforced peace halted the war in 1995, Rusmir, who’d stayed gallantly (“Stubbornly,”says Zorana) on to protect his homeland and care for his ill father, felt very alone. Except for his father, there was nothing left – no home, no job, no family, no future. Hari was gone, too, escaping on 1994 on foot via a tunnel dug under the Saravejo airport, and then over the mountains into Croatia, where after a long search he was reunited with his family. The Sakics emigrated here in January, 1995. Every refugee has a story. The Bosnians’ story is of suddenly being cast as warriors and wanderers in an ethnically-cleansed netherworld where borders and names suddenly meant the difference between freedom or imprisonment, between living or dying. It all happened before – to their parents and grandparents in World War II. It’s a story burned in their memories and hearts and told in stirring words, music and dance. After months of working with the musicians and UNO’s resident dance troupe she directs, the Moving Company, Metal-Corbin grew close to the refugees and their families, particularly Rusmir, Zorana and their children, now ages 12 and 6. 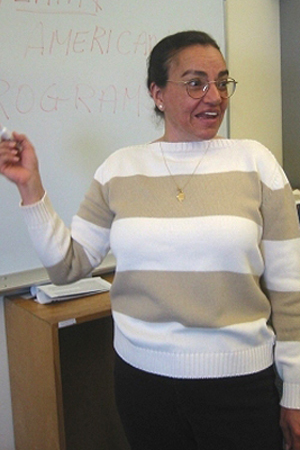 Zorana acted as the project’s interpreter and cultural guide. During the Creighton concert, which marked the dance’s premiere, Rusmir and the other, all-male musicians exuberantly accompanied the rousing dance from a rear corner of the stage. Rusmir, who grew up singing and playing the romantic tunes that accompanied the dance, says, “I feel the songs in my heart, in my soul, in my blood.” Song and dance are a big part of Bosnian celebrations, which can last from evening through dawn. A Gypsy song – “Djurdjevdan” (“Day of the Flowers”) – was chosen by Metal-Corbin to give the dance its thematic design. The song, like the dance she adapted from it, tells of a holiday when people go to a river to cleanse themselves with water and flowers as an act of atonement and plea for forgiveness. 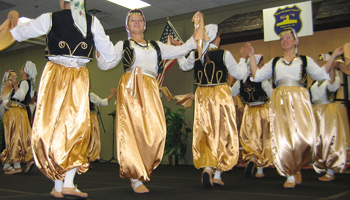 According to Rusmir, the song and dance reflect Bosnians’ forgiving nature. Hari, though, cannot so easily let go of the memory of Marina and their two children barely escaping a direct artillery hit on their Sarajevo apartment. “Forgive, yes, but forget, no,” he says. “I must try never to forget.” Even now, the whine of a siren and the clap of thunder are nervous reminders of incoming artillery rounds. “That is the kind of sound you can never forget,” Hari says. As a haunting reminder of what the dance was about, an enlarged news photo in the background pictured the tearful reunion of a Bosnian refugee family. The image had special meaning for Rusmir and Hari, who had only recently reunited with their own families. For them, the dance was their own personal commemoration of loss, celebration of survival, offering of thanks and granting of forgiveness. Adding further resonance, virtually the entire local Bosnian refugee colony attended out of a deep communal sense of pride in their rich culture, one they’re eager to share with the wider Omaha community they’ve felt so welcomed by. With the aid of Neb.Republican U.S. House of Representatives member John Christensen, Rusmir finally got permission to immigrate and was reunited with his family last November. Once here there were many adjustments to make. Igor didn’t remember him. Ida was slow to warm to a father she hadn’t seen for so long. Rusmir spoke no English. The family barely got by. But in classic immigrant tradition they’ve adapted and now call Omaha – a city they’d never heard of before – their home. “It is hard. But step by step, day by day, we make connections, we make new friends we make a good life, too. We feel like Bosnian pioneers in Omaha and Nebraska,” says Rusmir, who hopes to start a construction business with Hari. The Bosnians like America and feel sure they’ll thrive here. Their children already have, with many earning top grades in school. Ida and Lana are both healthy and doing fine. The Bosnians are deeply grateful to America, which Hari calls “a dream country” for its warm reception. America is, after all, the land of opportunity.